Owner Moving Up to a Larger Yacht! This Sea Ray L Class 590 Fly is new to the market with Class and New being the best way to describe this beautiful Yacht! If you never experienced the luxury of a Sea Ray L Class Yacht, you owe it to yourself and your family to view this beautiful Sea Ray L590 Fly. She is equipped with all the desired options to make your yachting experience specialwith family and friends on every trip short or extended! Every Captain will be a master at the helm of this easy to handle Sea Ray Yacht with three Joystick Docking Stations, in addition to the Sky-Hook Feature, Auto Pilot and Sea Keeper Gyroscopic Stabilizer preventing your yacht from rocking in rough seas. Check out all the factory options: Master Stateroom Safe Master Stateroom Head/Bidet Combo China Place Settings with Storage Salon Sofa with Pull Out Bed Wine Cooler Transformer Shore Power ISO Boost Generator Upgrade KVH HD7 Antenna for True HD Programing Stackable Washer and Dryer Separate Bow Seating Auto System Bow Seating Sun Shade AC/DC Cockpit Refrigerator Electric Retractable Awning over Bridge Aft Seating Bridge Aft Seating Sun-pad Filler Cushions Teak Flooring in Cockpit and Bridge Bridge Steps Teak Flooring on Hydraulic Swim Platform Gyroscopic Stabilizer Multi Station Docking Controls - Upper Bridge Helm, Lower Cabin Helm and Cockpit Zeus Joystick Raymarine GS 165 Upgrade - 3 Units Raymarine Fishfinder Raymarine i50 Depth Sounder Raymarine Network Cameras in Cockpit and Bilge Stainless Steel Anchor Engines, Transmissions and Generator Oil Changer Systems Transom Storage Upgraded Rockford Fosgate Fusion Speakers Exterior Seating Upgrade Bose Speakers High Gloss Tables Forward and Aft on Bridge High Gloss Table Cockpit Window Tint First impressions can be inspiring and stunning, but the L590 Fly extends that experience from first impression all the way to last. Mastery of the smallest details adds up to a beautiful experience that will stick with you long after you've returned to your shore life. You're left with an overwhelming sense of quality, precision and luxury that truly moves you. Please Note: This L Class Sea Ray Yacht is stored off site but easy to see just minutes from our Marinemax Pompano Beach location. 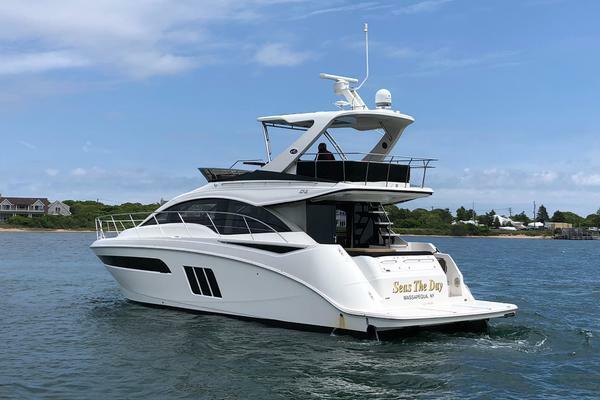 United Yacht Sales New Jersey would love to guide you through a personal showing of this 59' Sea Ray L590 Fly 2017. This yacht for sale is located in Pompano Beach, Florida and priced at $2,250,000. For a showing please contact us by filling out the form on this page and we will get back to you shortly!